You planned a luxurious week-long vacation in the tropics with your family; sleeping on linen sheets, sipping mojitos and spending that hard-earned money on souvenirs. But what happens when you bring back the wrong type of souvenir? It's almost a ghostly feeling: tiny legs crawl across you so lightly that you can barley feel them and creatures burrow in the lining of your mattress, nearly undetectable for months. The four millimetre oval-shaped bug most likely snuck into your home through your luggage. As time goes on, their colony grows and it's time for them to feed. These blood-sucking creatures hunt you down by the CO2 you're exhaling. They're bed bugs and they've been a persistent problem in Cincinnati for years. A problem that Tami Burkel says isn't prejudice to the rich or poor. Lucille, Tami and Jamie spend their days in a seemingly normal way; answering phone calls, logging information into a computer and... gassing homes across the Tri-State. They are the exterminating trio; three generations of women taking care of business. "We do a lot of things that other people don't do," Burkel said. Fumigation is a hazardous practice that deals with mixtures of chemicals that are toxic to most living creatures, including humans. Burkel and her crew of 12 employees at Valley Termite and Pest Control not only risking their own well-being, but they're doing a job most of us never would.WCPO Insiders can read about the sometimes dirty conditions exterminators work in and how owner, Tami Burkel, views being a woman in a male-dominated field. This piece details the dangers of bed bugs and lists several things to be aware of when dealing with a bed bug infestation. It also gives a blog section for you to give your feedback on. 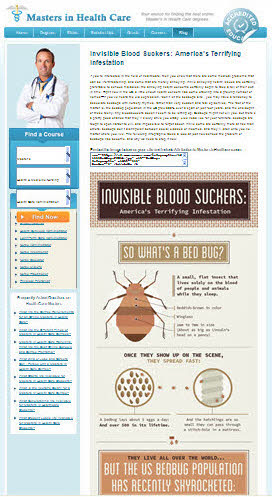 Invisible Blood Suckers: America’s Terrifying Infestation If you’re interested in the field of healthcare, then you know that there are some medical problems that can be life-threatening, and some that are merely annoying. While annoying health issues are certainly preferable to serious maladies, the annoying health concerns certainly begin to take a toll of their own in time. Right now in the US, a little known health concern has come crawling into a growing number of homes—if you’ve heard the old expression, “don’t let the bedbugs bite”, you may have a tendency to associate bedbugs with nursery rhymes, rather than very sudden and real epidemics. The fact of the matter is, the bedbug population in the US grew 500% over a span of just four years, and the onslaught of these teeny, tiny bloodsuckers doesn’t seem to be letting up. Bedbugs might not kill you, but there’s a pretty good chance that they’ll slowly drive you crazy. Like head lice for your furniture, bedbugs are tough to spot, harder to kill, and impossible to forget about. While some are certainly more at risk than others, bedbugs don’t distinguish between social classes or incomes, and they’ll latch onto you no matter where you live. The following infographic takes a look at just how serious the problem of bedbugs has become, and why we need to stop it now. Although heat treatments can be effective for bed bugs, this is not a treatment method you can do yourself. A Lexington, Kentucky woman recently set her home on fire while trying to treat her home with heat to kill bed bugs. 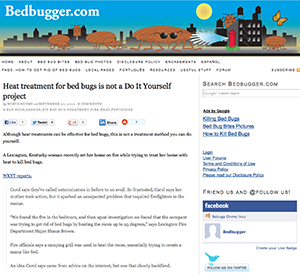 Heat (or thermal) bed bug treatment should never be attempted as a do-it-yourself project. It takes knowledge, experience, and skill, and the right tools. Knowledgeable and experienced professionals utilizing heat to kill bed bugs will heat the entire structure at its core to temperatures well over 120 very quickly, in order to avoid bed bugs trying to escape the heat. They will carefully monitor temperatures throughout the structure, to make sure every item and part of the structure reaches killing temperatures at its core. And they will know how to do this (and have the equipment to do it) without harming people or the building, and while minimizing harm to possessions. Sparrows, starlings, and pigeons are the most troublesome of the birds commonly found in the urban environment. When these birds congregate in large numbers their droppings can create a foul-smelling, unsightly mess. Netting can effectively be used to exclude birds from virtually any kind of structure and from roosting or nesting in trees. The net will not entangle birds. Netting may be draped across the front of buildings; fasten it tightly from above windows to below the ledge to discourage perching. Most birds prefer to perch on flat surfaces. Surfaces with an angle of 60 degrees or greater cause birds to slide off when they try to land. Wood or metal sheathing cut at an angle can also be added to the problem area. Another deterrent is to install porcupine wire on ledges and rails where birds roost. Thinning tree branches will remove perch sites and reduce a source of wind protection, which may force the birds to move to another site. Combinations of noise (AM/FM radio, wind chimes, firecrackers, banging pots and pans) and visual stimuli (colored flags, reflective tape, revolving lights, balloons, replicas of hawks and owls) used persistently can evict birds. 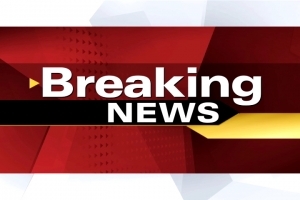 Control measures should be initiated as soon as the problem is identified. West Nile virus is transmitted by the bite of an infected mosquito. It is widespread in Africa, southern Europe, and western Asia. It first appeared in the United States in 1999 in the greater New York City area. In 2007, there were human cases in 45 states. It has caused illness and mortality in humans, wildlife and domestic animals, especially birds and horses. In humans, it causes an influenza-like illness that may lead to aseptic meningitis, encephalitis, and death, especially in persons over 50 years of age. 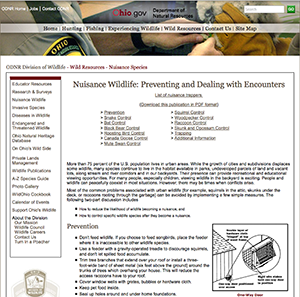 West Nile virus is important because it affects not only people, but also wildlife (including many game animals), and some domestic animals, especially horses. While dead crows and blue jays can be valuable warnings of WNV activity, we are no longer accepting dead birds for testing. Please contact your local health department if you would like to report dead bird sightings. 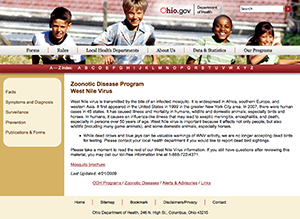 Please take a moment to read the rest of our West Nile Virus information. If you still have questions after reviewing this material, you may call our toll-free information line at 1-888-722-4371. Learn about Hershey, our bed bug bustin' canine! He is professionally trained to detect bed bugs more accurately and quickly than his human partners! 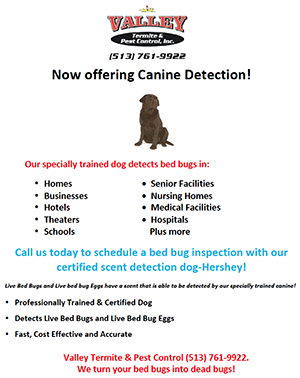 Download our flyer to learn more about our canine detection bed bug service.